Monster cookies made the news this week, but they weren’t called Monster Cookies. They were called Ann Romney’s Oatmeal Peanut Butter M&M Cookies and were one of the contenders in Family Circle’s ever popular Presidential Cookie Bake-Off. Competition was stiff and in the end, Michelle Obama’s version of chocolate chip cookies won, but Monster Cookies are still in a winner in my book. 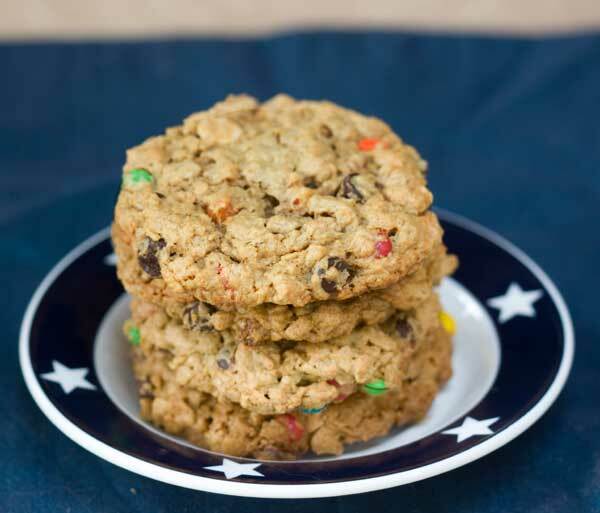 Monster Cookies are giant peanut butter cookies with oatmeal, M&Ms and chocolate chips. They can be made with or without flour and can be chewy , crunchy or a little of both. Another nice thing about Monster cookies is they can be made in one bowl and do not require an electric mixer. They are one of the most relaxing cookies to bake, and if I lived in a country that had a quota on how many cookie recipes a person could own, Monster Cookies would be among my select few. They have everything! This recipe is adapted from one of the best cookie books in the world, The King Arthur Flour Cookie Companion: The Essential Cookie Cookbook (King Arthur Flour Cookbooks) . I usually scale it down and make small batch monster cookies, but a neighbor just brought home a new baby so I made their family a large batch of Monster Cookies. Unlike Ann Romney’s flourless monster cookies, this version uses some flour. For the chips, I used white, butterscotch and chocolate (because I happened to have them all), but you can use whatever type you want. The candy coated chocolates are Mini M&Ms which are super cute and which I was lucky to find at the grocery store. Feel free to use regular M&Ms. And if you’d rather make Ann Romney’s, check out Katrina’s blog today. She made the ones featured in the competition. Oatmeal peanut butter cookies with M&Ms or "Monsters"
Preheat the oven to 350 degrees F now, or wait and do it a little later in the process. The dough will need to sit for 30 minutes. Have ready two or three greased or nonstick foil lined baking sheets. 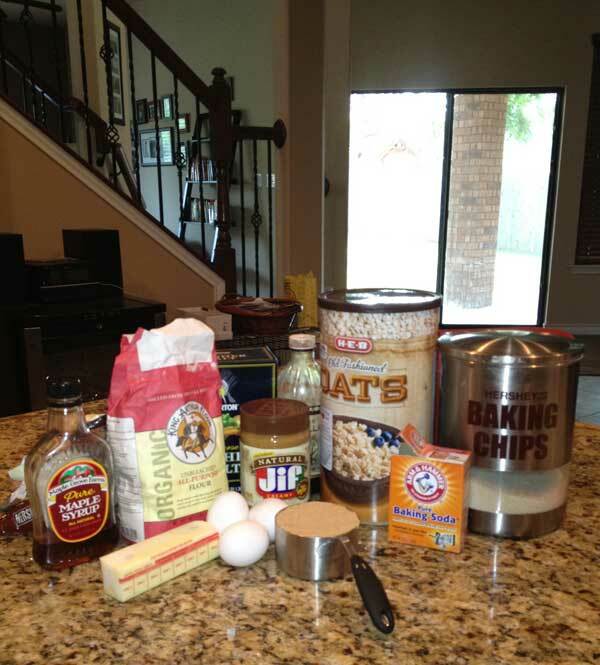 In a large mixing bowl, stir together the eggs, both types of sugar, baking soda, salt, maple syrup and vanilla. Stir in the peanut butter and melted butter. When mixed, add flour and stir until blended. Lastly, stir in the oats, all the different chips and the candies. Let the dough sit for 30 minutes so that the oats can absorb some moisture. At this point, you might also want to preheat the oven. Using a quarter cup measure, scoop up dough and arrange mounds about 4 inches apart on the sheets. Press the tops down slightly to flatten somewhat (you want even mounds rather than spheres). Bake at 350 degrees F for 12 to 15 minutes or until cookies appear set and lightly browned around the edges. Let cool on the baking sheet for 5 minutes, then transfer cookies to a wire rack to cool. The recipe is supposed to make 26 cookies, but I usually get 22-24. Thanks for the review, Katherine! These cookies are awesome! Sturdy, crisp outside, tender inside and packed with lots of goodies. I didn’t have white or butterscotch chips, but was happy with just chocolate chips and m&m’s I also threw in some peanut butter chips too. I will be making these again soon. May even throw in some chopped peanuts. Or better yet peanut m&m’s! Yeah my mom used to make thease cookies for us and they are the best. Sarah, thanks for the review! I might make another batch for our block party this week. One thing I noticed was the batch I accidentally over-baked was crunchy and delicious despite being a little too brown. Since I like crunchy cookies, I may make another batch and try baking at a lower temperature (325) for a longer time. Hopefully slower and lower will make them crunchier without being too brown. They’re good baked at 350 too, but I still want to test at 325. Made a half batch of the recipe last night. SO GOOD!!! We didn’t have butterscotch so we added heath crunchies instead. For a half batch, we used one egg an the egg white of another egg. it made about 19 cookies. I guess my cookies aren’t nearly as large as the recommended size, but they were pretty big nonetheless. Delicious, will definitely make again! I am going to give both recipes a try. Michelle Obama’s recipe has to have a typo in it – no way it would need 2 cups of butter/shortening. It is just the Tollhouse recipe with different chips in it. Oh, how I love monster cookies. YUM! I looked and my recipe does call for corn syrup. I wouldn’t have thought to put maple syrup in but now I’m wondering about that or Lyle’s Golden syrup, or maybe even honey? I love the bake-off! I think these may replace my previous favorite (Cindy McCain’s). Who doesn’t love monster cookies!? I haven’t made them in years. I wish I had more excuses to bake! I’m going to go look at my recipe. I don’t remember any kind of syrup in the recipe. Do you taste it? I love your humor, Anna. Your neighbor brought home a baby (hers). I laughed! And I know why mine turned out better (jk! )–I used Skippy Natural instead of Jif. Not sure why, but I’m a Skippy PB person. Funny I say that though, because I only buy all natural brands for me that are just peanuts. But I buy Skippy for the rest of the fam (and for baking). Your cookies do look good. I admit, I had to run to the store for some M&Ms. Caralyn, I’d be curious to see your recipe. These sound great, and I’ve got everything on hand except the M&Ms!